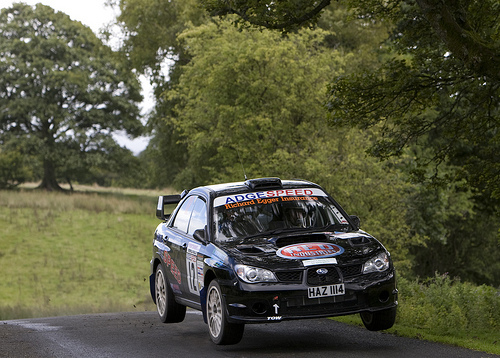 Last weekend saw Adrian Spencer and Mark Hewitt back out on the MSA Asphalt Championship with the Mewla Rally held over 90 miles of the MOD Epynt ranges near Builth Wells. After having retired on the previous 2 rallys due to niggling problems, the team were hoping to get their first finish and get some more experience and confidence with the new car. Wet weather greeted the teams as they arrived on the ranges after starting from the Welsh showground in Builth Wells which meant that tyre choice is a bit of a gamble as it can be dry at one end and wet at the other. 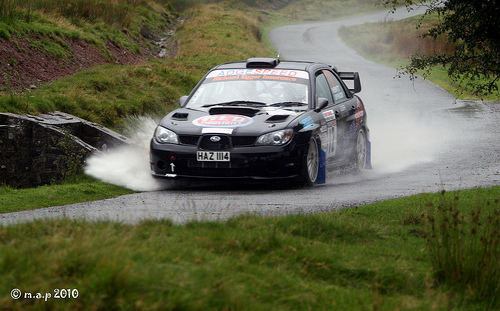 Looking at the weather Adrian and Mark opted for wets which proved to be the correct choice for the 1st loop of 2 stages. A cautious start and loosing 15 secs when the car stalled in a chicane and being slowed with a misted screen when the fuse blew, Adrian and Mark finished the 1st leg in 16th place, but at least they had got further than on the previous 2 rallies. With the weather staying the same for the next 2 stages wets were still the tyres to be on and with no problems to sort out at service except for the heated screen blowing fuses, Adrian and Mark headed out. The next 2 stages went well except that lamb chops were nearly on the menu, as when flat out over a slight left on crest, two sheep decided to cross the road and hitting a sheep at 120 mph is not recommend either for the sheep or the rally car. A good run and they had moved up to 13th. With the roads still wet at service on Mabion Way, Adrian decided to stay on wets however this proved to be the wrong choice as the roads had nearly dried out and being unable to push they remained in 13th at the end of the 3rd loop. A change to slicks for the final 2 stages and with confidence building Adrian went for maximum attack and set the 8th quickest time on stage 7 which moved them up to 11th and with the leading car of peter Lloyd going off the road in his Impreza S14 WRC on the last stage and 10th overall was on the cards. A run back to the show ground and the results were confirmed with Adrian and Mark 10th overall and 4th in class. The team were delighted to get to the end and record their first finish in the new car and with most of the niggles sorted adrian and mark are looking forward to there next rally. First picture courtesy of Marc Price. Second picture courtesy of Chris Pons.